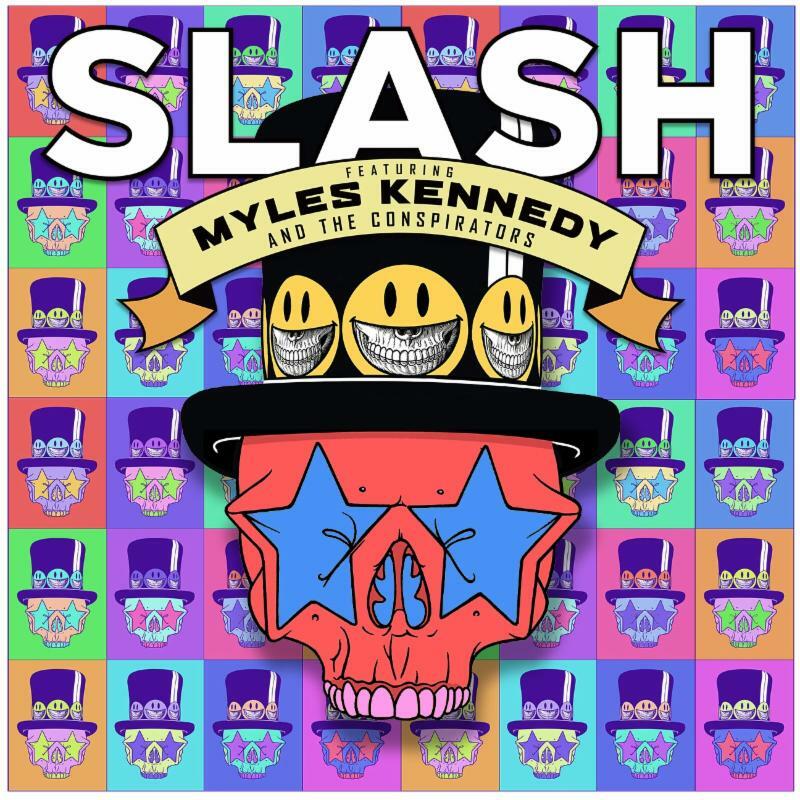 Today, Friday, August 17, SLASH FT. MYLES KENNEDY AND THE CONSPIRATORS have unveiled the new song “Mind Your Manners,” off their new album titled LIVING THE DREAM out on September 21 via SLASH’s own label Snakepit Records , in partnership with Roadrunner Records . The new song follows the release of first single “Driving Rain” now the highest charting radio debut of SLASH’s solo career cracking Top 20 at Rock radio with a climb to #17 this week. “D riving Rain”has already generated well over 1 million streams . Listen to “Driving Rain” HERE and “Mind Your Manners” HERE , purchase the songs digitally HERE and pre-order LIVING THE DREAM HERE . 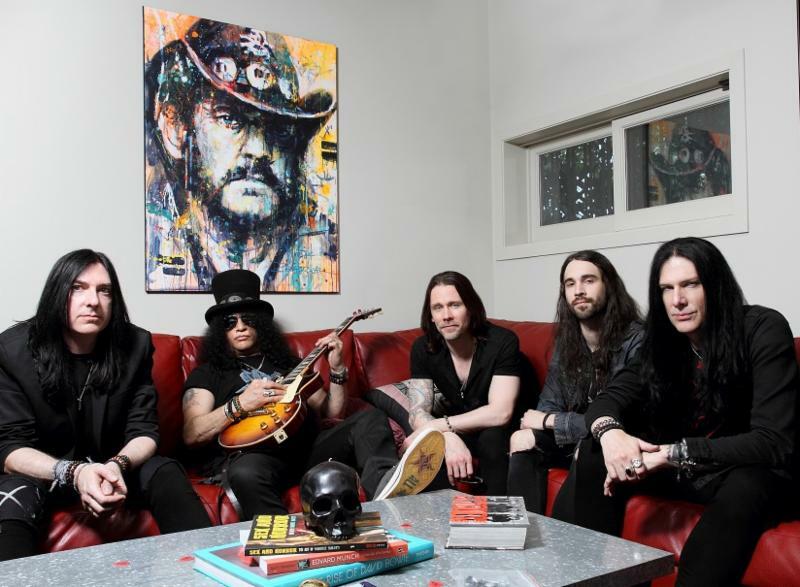 SLASH FT. MYLES KENNEDY AND THE CONSPIRATORS (L-R): BRENT FITZ (drums), SLASH (guitar), MYLES KENNEDY (vocals) FRANK SIDORIS (guitar & vocals) and TODD KERNS (bass & vocals). 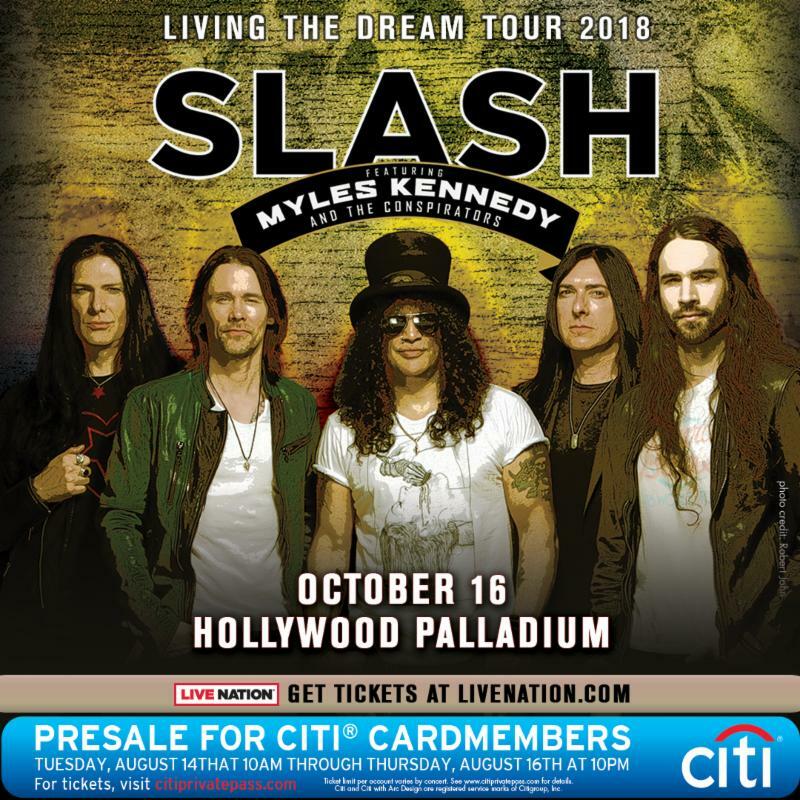 T oday, August 17 , SLASH FT. MYLES KENNEDY AND THE CONSPIRATORS announced a secondLos Angeles show set for October 16 at The Palladium in Hollywood, CA . Tickets for the Octo ber 16 Los Angeles show are onsale starting today, HERE . 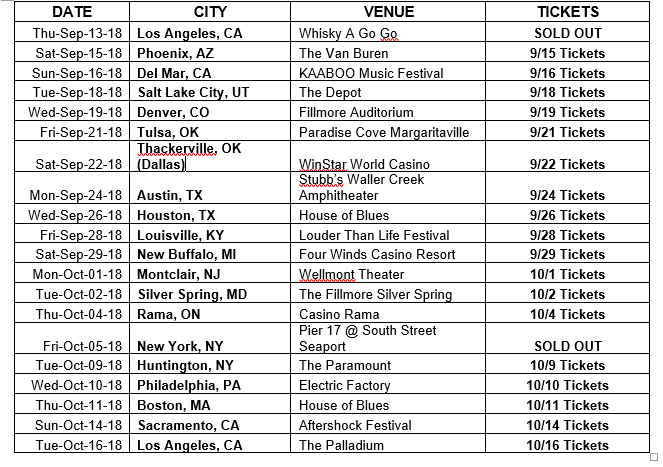 The group’s North American headlining tourofficially begins September 13 in Los Angeles and will visit 20 major cities including New York, Denver, Philadelphia, Boston, Washington, DC (Silver Spring, MD), Chicago (New Buffalo, MI), Dallas (Thackerville, OK), Austin, Houston, and more before ending October 16 in Los Angeles (all dates below). All tickets for the fall SMKC tour are available at : http://www.slashonline.com . LIVING THE DREAM is SLASH’s fourth solo album, and third with SLASH and his bandmates MYLES KENNEDY (Vocals), BRENT FITZ (Drums), TODD KERNS (Bass & Vocals) and FRANK SIDORIS(Guitar & Vocals). On LIVING THE DREAM , SLASH and his band re-teamed with producer Michael “Elvis” Baskette (Alter Bridge, Iggy Pop, Incubus) on the powerful 12 song collection . The band’s previous albums World On Fire and Apocalyptic Love , debuted in the Top Ten on 12 charts globally, spawned three #1 hit singles at U.S. Rock Radio and earned worldwide praise garnering SLASHsome of the best critical acclaim of his career. World On Fire was tagged by Guitar World as “another bold and unapologetically riffy statement” and “a varied, immersive and incredibly hard rocking effort” (December 2014). Rolling Stone described Apocalyptic Love–the band’s debut album–as “filled with head bangers and plenty of fancy fretwork” and Revolver declared it “a collection of lean, high-octane rock-and-roll tunes built to be blasted out of open-top sports cars, or more suitably, open-air stadiums” (May 2012). LIVING THE DREAM album cover art created by artist Ron English. S LASH –the iconic, GRAMMY-winning , American rock guitarist , songwriter and film producer –has amassed album sales of over 100 million copies , garnered a GRAMMY Award and seven GRAMMY nominations and was inducted into the Rock and Roll Hall of Fame . SLASH landed on the top of the charts with his first solo album , Slash (2010) which featured Ozzy Osbourne, Fergie ,Myles Kennedy and more. 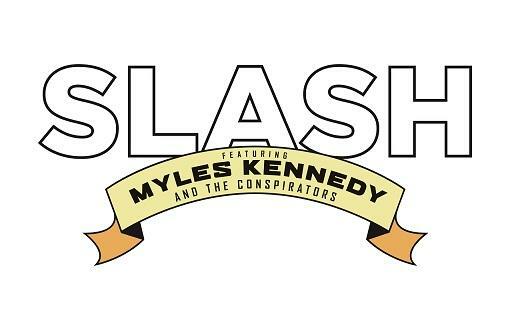 Shortly after, he formed his current band SLASH FT. MYLES KENNEDY & THE CONSPIRATORS –which features MYLES KENNEDY (lead vocals), BRENT FITZ (drums), TODD KERNS (bass/vocals) and FRANK SIDORIS (rhythm guitar)–who’ve been touring worldwide and making music for over four years . SLASH FT. MYLES KENNEDY & THE CONSPIRATORS released the critically acclaimed Apocalyptic Love (2012) which stormed the Billboard Top 200 Albums Chart debuting at #4 as the top rock album .  Apocalyptic Love has the added distinction of spawningSLASH’s first-ever #1 rock radio solo hits : “You’re A Lie” and “Standing In The Sun.” SLASHreleased Nothing Left To Fear (2013) the first-ever motion picture he co-produced from SLASHfiction, his film/TV production company specializing in the horror genre. He is currently working on a new film project. SLASH FT. MYLES KENNEDY & THE CONSPIRATORS unleashed their second album World On Fire to worldwide praise garnering SLASH some of the best critical acclaim of his career. SLASH’s third straight solo album to debut in the Top Ten , World On Fire achieved over 12, Top Ten chart debuts around the world . The album’s title track, first single “World On Fire” ascended to #1 at U.S. Rock Radio . In 2016, Guns N’ Roses re-united and SLASH joined Axl Rose and Duff McKagan for the ongoing “ Not In This Lifetime Tour” which Billboard now ranks as the fourth-highest grossing tour of all time .